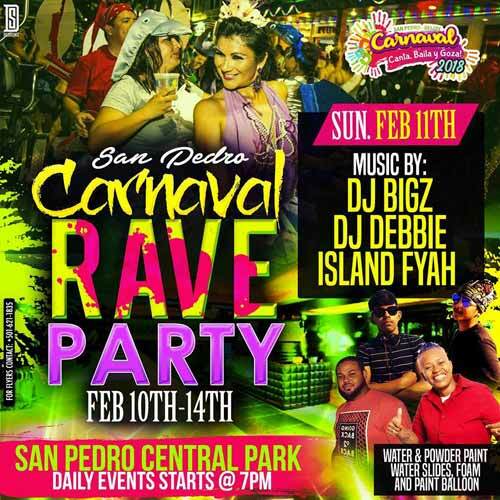 The great carnival of San Pedro 2018! More details coming soon. 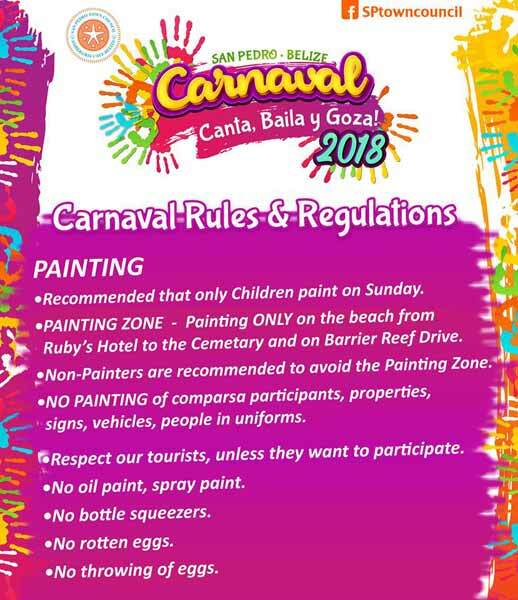 Please take note of these important Carnaval Rules! Carnaval is color, tradition and celebration! 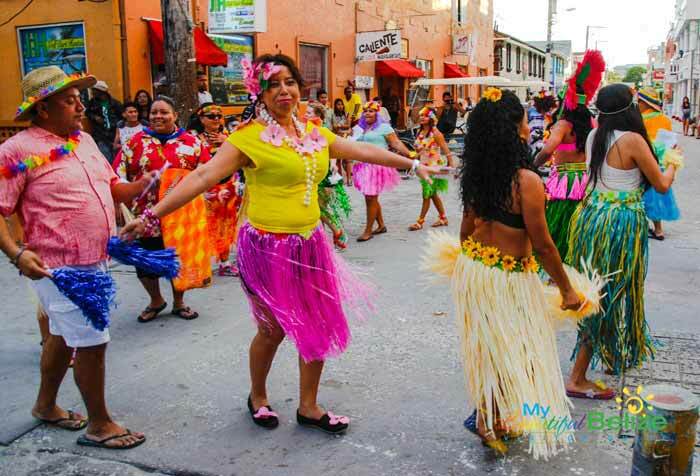 A pre-Lenten festivity that was once widely practiced in northern Belize, the Carnaval tradition has managed to survive in a few places in the country, namely Caledonia Village, Corozal District, and Ambergris Caye, Belize District. Commencing with the enmascarados – masked dancers – groups go throughout the village signaling the start of Carnaval. This all takes place three days before Lent and is similar to the Mardi Gras festivities in the US. During the three days of revelry, dancers go from home to home to perform ‘Comparsas’, which traditionally include “El Torito”, “El Papalotito”, “La Culebra” and “La Cinta”. In recent years, the traditional Hog Head dance has been incorporated into the festivities. 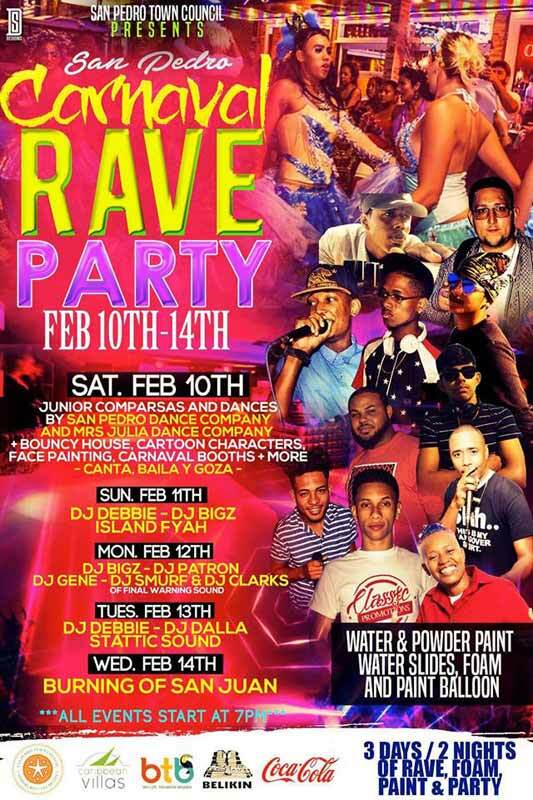 On Ambergris Caye, the town of San Pedro has taken the Carnaval festivities to an entirely different level. Groups of Comparsas dancers plan months in advance, from costumes to lyrics and music, their themes vary each day. One thing that stands out every year is the commentary, and the lyricists’ insight to the happenings around the country. Taking serious news (national and international) and converting it into a humorous play, in Spanish, is about talent and the songwriters have it in spades! Paint or Be Painted! 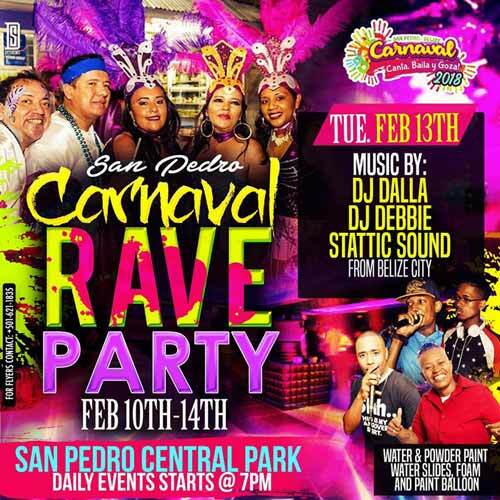 San Pedro’s UNIQUE Carnaval is Coming SOON! Mardi Gras or Carnival, the holiday is celebrated around the world. The festivus of eating, drinking and naughtiness before the beginning of Lent. Different places do different things…we all know about the celebration in New Orleans or in Rio (Brazil attracts 70% of its tourists during this week alone!) but in San Pedro, it’s been going on for decades and it is totally unique. This is a festival that’s been held for decades – before San Pedro had tourists. Get covered in paint with local kids, dance in the park, drink Belikin beers on a dock and then take a dip in ocean. Inviting all Comparsas to sign up at the San Pedro Town Council. Deadline to sign up is February 7, 2018. As we near Carnaval season, we would like to re-introduce the various components of the pre lenten celebration. During the last few days leading up to Ash Wednesday comparsas would begin to be performed. Dance troupes, accompanied with musicians, would travel through the streets of the community performing comparsas at individual homes or businesses where they would be offered refreshments and, depending on what dance and how many were performed, a small fee would be given. 1. Traditional- dances with children and adults. Some examples are “the always present” and very traditional El Torito, La Cinta, El Negrito, El Alacran, Sandunga, El Papalote, Caracolito etc. 2. Adult comparsas “las criticas” criticism – was to ridicule immoral behavior, especially by the elite, it was an opportunity to slam the untouchables with their hidden lives; examples are Bailen Chachacha, Silva Sylveria, La Rhumbera, Cabeza de leon etc. In good natured fun, men would clothe themselves in dresses with over-exaggerated female forms and painted faces singing the stories of what had transpired over the past year. All the while, performers were careful not to call out anyone’s name. Booths Available for the Carnaval Fiesta Block Party only! Free of charge, for Saturday, February 10th! Sign up now at the San Pedro Town Council! 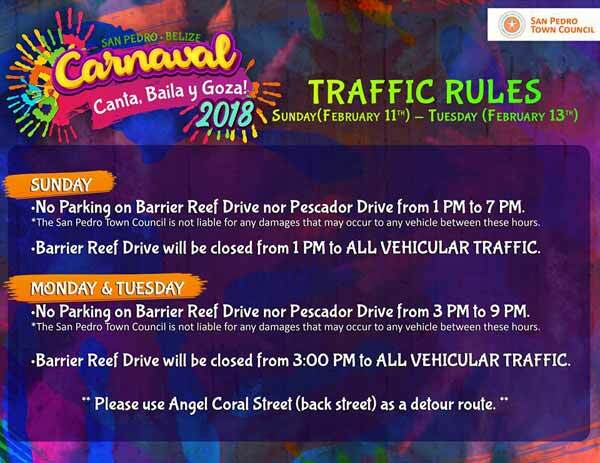 Calendar of events for Carnaval 2018! The Carnival is here again! Barrier Reef Drive will be closed Saturday 10th February at 1:00pm. On Monday the 12th and Tuesday the 13th there will be restrictions on parking on Barrier Reef Drive and Pescador Drive, from 3:00pm, this is to allow the children to play "painting" safely. Drivers should use Angel Coral Street from 3:00pm on these days. Come out tonight to the SPHS Auditorium for La Reina del Carnaval Pageant Fundraiser. Mrs. Flora Ancona, her team and contestants have a great show prepared for all to enjoy! There will be food and drinks on sale! Que Viva el Carnaval! 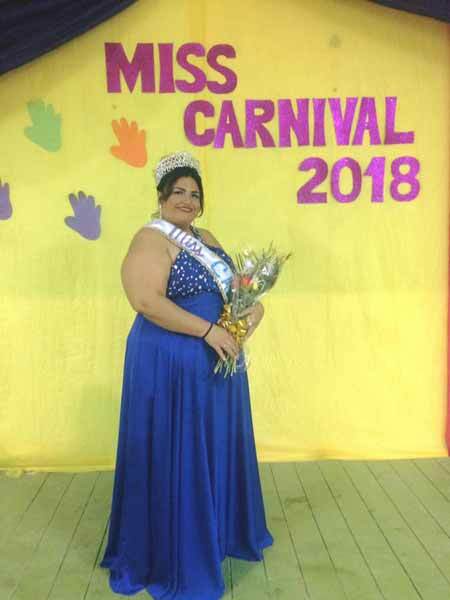 Congratulations to the newly elected Miss Carnival 2018, Ana Najarro! 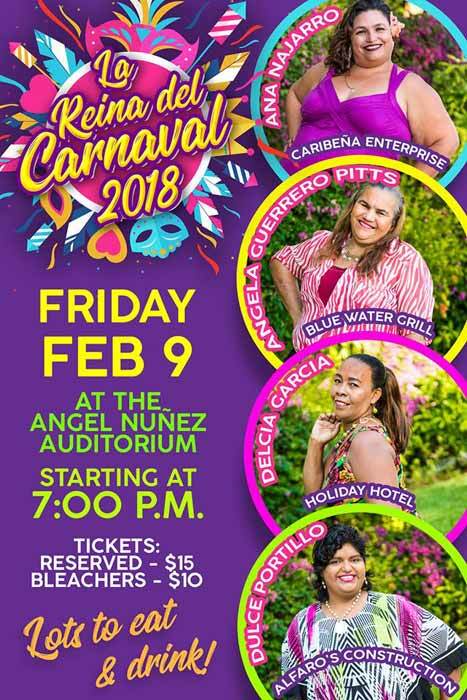 Canta, Baila y Goza – is this year’s Carnaval theme and on Friday, February 9, 2018, five beautiful contestants took on the stage as they competed for the title of Reina del Carnaval. Singing, dancing and having loads of fun Ana Najarro, Angela Guerrero Pitts, Delcia Garcia, Dulce Portillo and ElsaWiltshire proved to those in attendance that beauty comes in all ages. The Angel Nuñez Auditorium roared in laughter and applause as spectators gathered to enjoy an evening with the five beautiful contestants who had promised an evening of much entertainment. The crowd went wild as the lovely contestants came out in their opening presentation in colorful costumes and proudly introduced themselves to everyone in attendance. Taking first runner up was the lovely Dulce Portillo and winning the grand title of La Reina del Carnaval was Ana Najarro. Congratulations to Ana and all the lovely contestants for putting up a great show…Que Viva el Carnaval. Can you tell me when the parade is? The way we celebrate Carnaval is unique. There will be 3 days of street dancing by various groups. This is all very hit and miss. You will need to go in search of the dancers but they will be located on the main downtown streets and you won't be able to miss them. In addition there is a showcase at the San Pedro House of Culture highlighting Carnavals of the past. There will be nightly events at Central Park. During the day for the next 3 days you may also run the risk of getting painted. 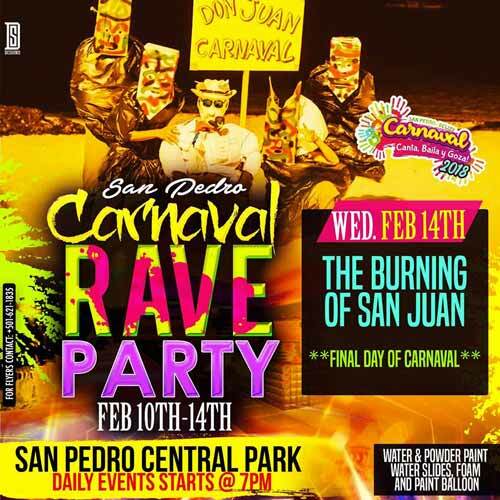 Wednesday, which is Valentine's day, you will see Don Juan Carnaval (effigy) being burned. And this will be your last chance to enjoy a lobster dish for the next few months. Our big street parades and street dancing extravaganza is in September. On a very short ceremony, the San Pedro Town Council held the opening ceremonies for Carnaval 2018. Master of Ceremonies, Mr. Eiden Salazar invited everyone to stand for the national anthem which was then followed by a prayer. As part of the ceremony, MC Eiden Salazar invited everyone for a moment of silence in remembrance of the late Mr. Felix Ayuso Jr. is a great icon during Carnaval, popularly known for his passion and drive to celebrate and carry on the old tradition. The family of Mr. Felix Ayuso Jr. was present at the event where they were acknowledged and presented a unique tshirt designed to honor his memory. The shirts were put on sale and all proceeds of the shirt will go towards the San Pedro AIDS Commission in honor of Mr. Felix Ayuso Jr. The San Pero AIDS Commission was another passion of Mr. Ayuso. An avid fan himself, Councilor Hector "Tito" Alamilla, delivered the welcome address in which he expressed his love for this old and very unique tradition. Hon. Manuel Heredia Jr. delivered the keynote address where he shared memories of his experiences during Carnaval in San Pedro. Lastly, Councilor Flora Ancona delivered the closing remarks where she thanked everyone for assisting the event and those that made the event a great success. She also took the time to invite everyone to participate in this great and unique tradition so that the younger generations can enjoy of it too. The audience were delighted with entertainment from the San Pedro Dance Academy which never fail to impress the crowd with their rhythmic choreography and vibrant costumes. The Bad Bunnies Comparsas Group!, 2min. Sing, dance, and enjoy! Las Pocahontas Comparsas Group!, 2min. The great carnival of st. Peter! Long live the tradition!, 1min. El Gran Carnaval De San Pedro! Foam party and painting in full swing at the Central Park! 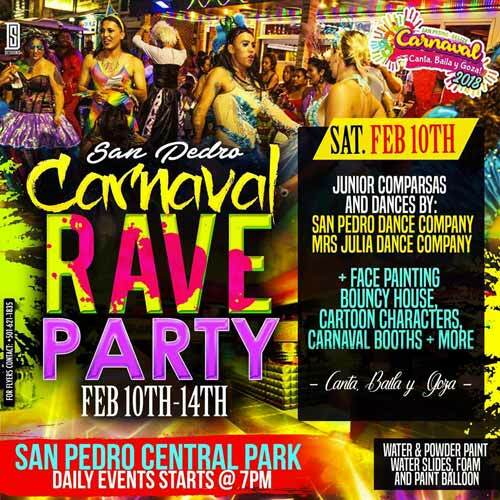 Dance performances at the official opening of the great carnival of San Pedro!, 1/2min. Long live the tradition! San Pedro Carnaval 2018 Street Dancing, 15min. 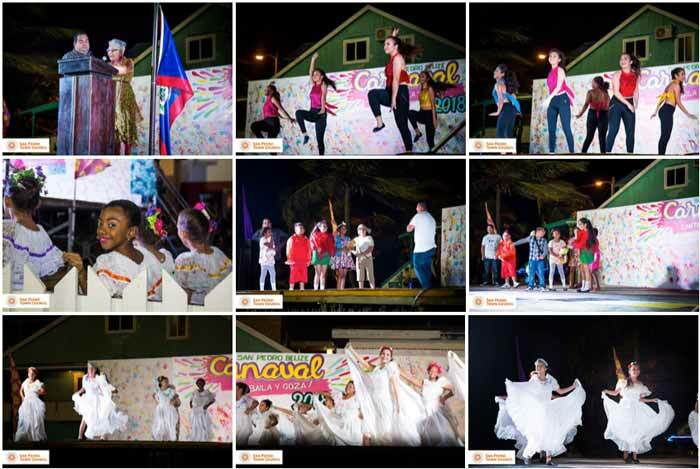 Carnaval 2018 has officially begun and on Sunday, February 11, 2018, the children enjoyed the painting and foam party at Central Park. 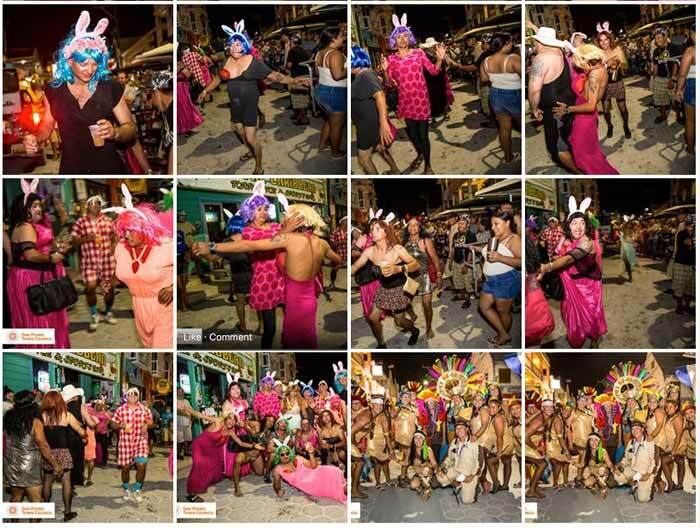 This year two groups of adult comparsas took the streets of San Pedro to entertain everybody. Dona Flora’s Group were “Pocahontas” and danced the night away to melodious beats, followed behind by the ever popular “Barbies”. Without fail the men’s group always draws a crowd and this year they danced to the popular “Moviento Naranja” beat dressed as beautiful bunnies. Below are pictures of this year’s first day of Carnaval for your enjoyment. Don’t forget to head on out today and enjoy Day Two of Carnaval! 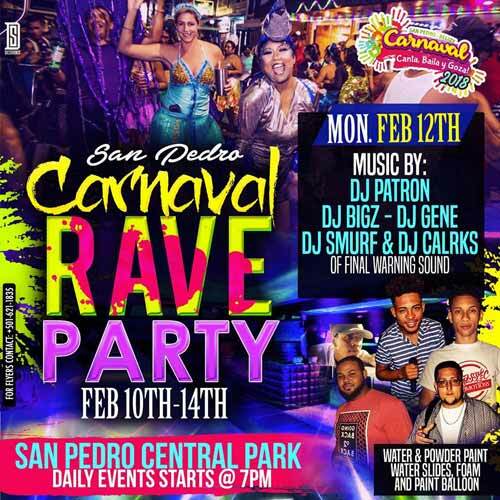 San Pedro’s Carnaval is back! 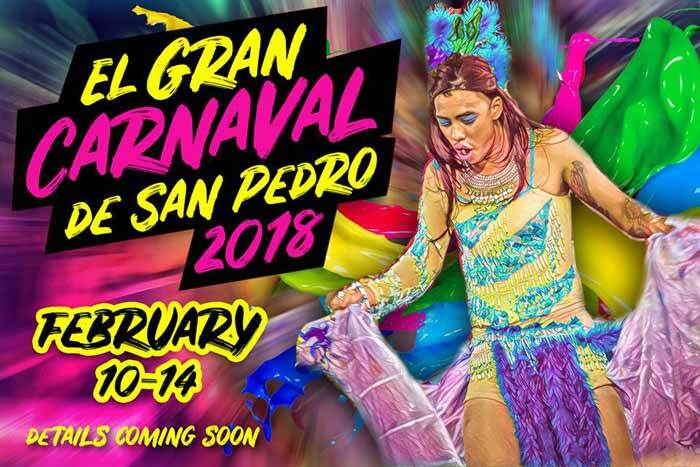 San Pedro Town is once again in a festive mood with the anticipated ‘El Gran Carnaval de San Pedro,’ which started over the weekend. Official ceremonies were held on Saturday, February 10th at the Central Park under the theme ‘Canta, Baila, Y Goza!’ The festivities so far have attracted hundreds of residents and visitors alike, who are enjoying the block parties, and the colorful comparsa dance groups’ performances on the main streets of downtown San Pedro. The three-day festivity kicked off with a short formal ceremony on Saturday with members of The San Pedro Town Council addressing the community. The event started with a minute of silence in memory of the late carnavalero Felix Ayuso. Ayuso’s family was presented with t-shirts commemorating the life of their deceased loved one. 1 registered members (1 invisible), 46 guests, and 5 spiders.